Let me preface this by saying that I am not concluding that all parents don’t appreciate teachers. I teach in a small community and I know from experience that most parents are very appreciative and supportive of us. We have some awesome parents who are constantly telling us and showing us how much they appreciate what we do for their children. Our PTO makes lunches for us, buys us gifts, and even reimburses us for classroom supplies. Supportive parents reassure us that we’re doing a good job, and we need that every once in a while. However, I have only been teaching for 4 years and I have witnessed a disturbing amount of parent encounters and interactions that were lacking any kind of appreciation, and even being downright disrespectful to their child’s teacher. I’ve seen parents yelling at their child’s teacher in front of all the students for making one small mistake. I’ve seen parents bashing their child’s teacher on social media because they didn’t agree with a minor disciplinary action. I’ve seen parents blame teachers for their child’s poor grades, and also for their unruly behavior. I’ve seen parents allow their own children to be completely disrespectful to their teacher because they claimed they had a “personality conflict,” when really, their child was just a defiant troublemaker. Those are just a handful of examples that I’ve witnessed…and those all happened this past school year! I don’t know about you, but when I was in school, I didn’t like every teacher I had, and I’m sure my parents didn’t agree with every move they made, but we respected the teachers and we made the best out of it and took lessons from each year. I still behaved, did my homework, tried my best, and if something didn’t go well, my parents would ask ME what happened, and help ME resolve the issue, not blame the teacher. Let me also say that I know not all teachers are outstanding educators. Not all teachers love and accept all of their students and not all teachers do everything in their power to help their students succeed. Some teachers are good teachers, but are having a really challenging year whether it be due to difficult students, or even troubles at home that affects their teaching. It is definitely no easy task to be going through a tragedy or some kind of internal struggle, and having to smile and pretend that everything is wonderful and go on with your daily lesson plans. Whatever the case or circumstance, I feel that I need to set the record straight or simply remind parents why they need to appreciate their child’s teachers. Reason #1: This job is harder than you think! 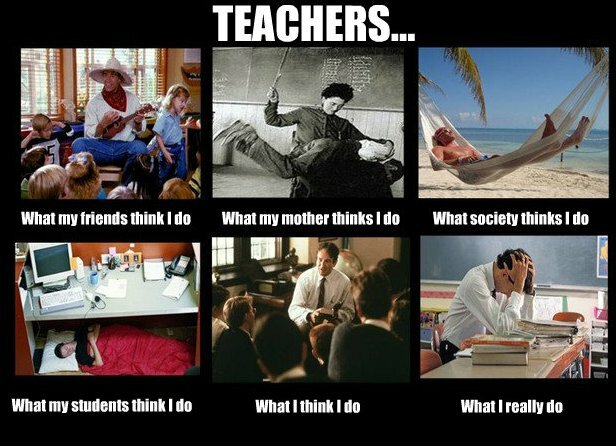 I think that some people are under the impression that teaching is an easy career. I mean, we already learned all that stuff when we went through school, right? Well, just because you have knowledge of something doesn’t mean you can teach it. Just ask my husband, the med student. There are some brilliant doctors who teach his classes, who are clearly extremely knowledgeable about their field, but they can’t teach worth a darn. Most classroom teachers these days are trying to teach at least 25 kids with different learning styles and a ridiculously wide range of reading levels (I think my record range is reading levels of 1st grade to 10th grade…and keep in mind I teach 5th grade). Each student practically has their own individualized education plan because every kid needs something different. And not only does each kid learn differently, but each kid also responds to different behavior plans. A classroom is a constant revolving door with kids coming in and leaving for speech classes, resource rooms, remediation classes, literacy groups, etc. On top of the actual teaching part, teachers have a lot of other responsibilities, paperwork, grading, student data, and much more to keep up with during our “spare time.” My desk is constantly cluttered with papers, piles, and post-it notes reminding me of all the things I need to do that day before I leave, what can wait until tomorrow or even next week. My point of all of this is not for you to feel sorry for how chaotic our job is, but for you to realize that we do whatever we need to do to help your child succeed! If each kid needs a different plan, a different lesson, a different behavior system, you name it…we’ll do it because that’s what we do. If your child doesn’t meet their potential, we don’t feel that we’ve done our jobs. We don’t give up on your kids because our job is to help them succeed! 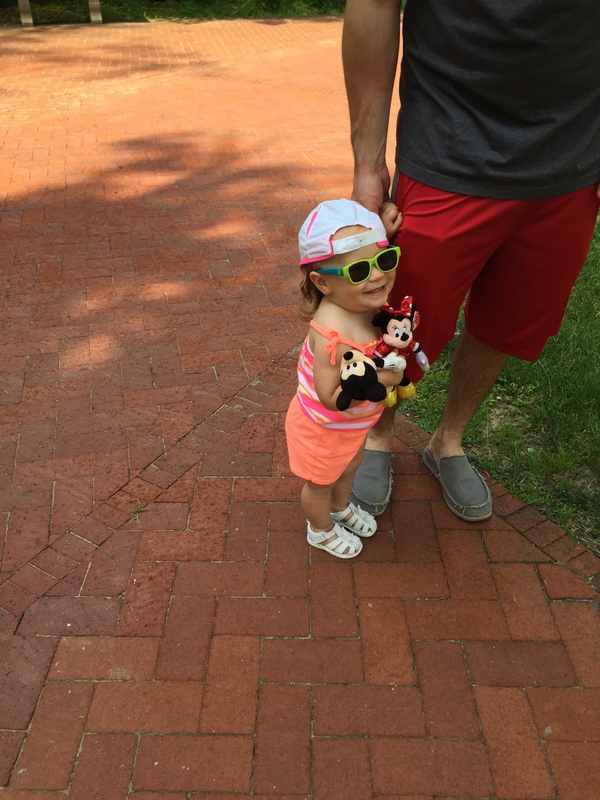 Reason #2: We have our own lives…but we’re still always thinking about your kids! Please remember that teachers are people too. We have families to love and care for, houses to clean, chores to complete, errands to run, bills to pay, etc. Teaching is just our job, not our whole lives. However, while many people leave work at 5pm, go home, cook dinner and don’t think about their job again until 7am the next day, teachers always bring their work home with them. I don’t just mean grading papers or preparing crafts. Every night, I think about my students. I think about if they have a parent to greet them when they get off the bus. I think about if they are getting a meal that night. I think about if they are getting tucked in at night or if they are basically fending for themselves each night (it happens more than you think). Many teachers do bring papers home to grade and other schoolwork home to work on that evening or over the weekend. 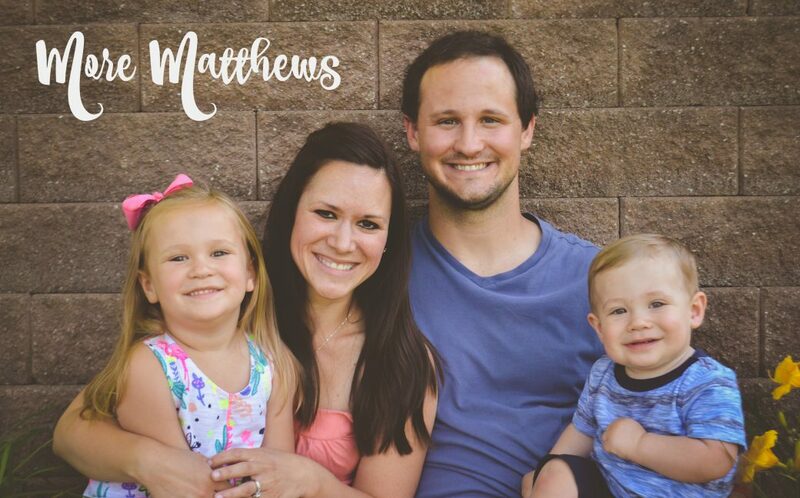 I know of a lot of parents who expect grades to be posted first thing every day…but they must forget that we have families too, and we are trying really hard to balance our home lives with our job. Since I became a mom almost 2 years ago, I have struggled daily with this balance. I feel like I can’t be a great mom/wife AND a great teacher. I feel like I have to pick one to be great at, and the other I will just settle for mediocracy. I know of SO many teachers who struggle with this as well. What works best for me to accommodate both is to compartmentalize each one. When I’m at school, I’m all in…100% teacher. I hardly think about things I have to do at home. I try to focus on my students and what they need from me that day. 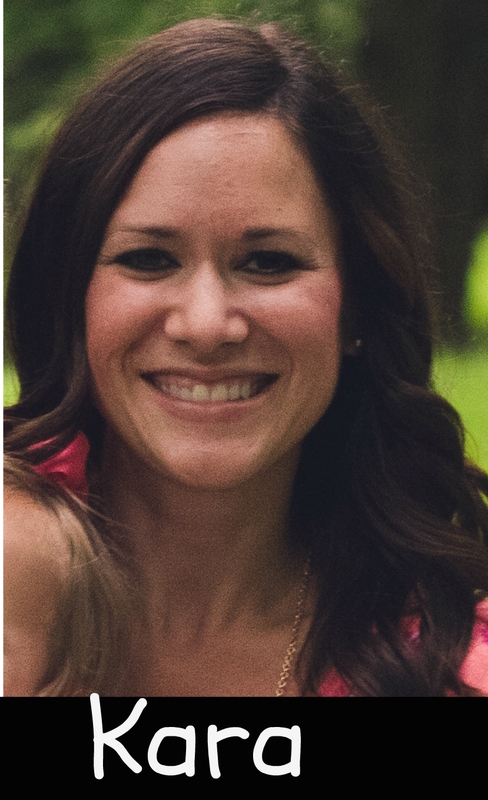 When I get home, I’m all in…100% wife and mom. I don’t work on school stuff at home (most of the time) and I cherish that time with my family. I may always feeling behind on grading and other school work, but that’s a price I’m willing to pay because my family deserves all of me. If you want us to be at our best when we are with your kids, then we need time with our families to relax and rejuvenate, just like you do when you get home from your job. And keep in mind…even when we are at home “relaxing”, we are still thinking about your kids. We never stop. 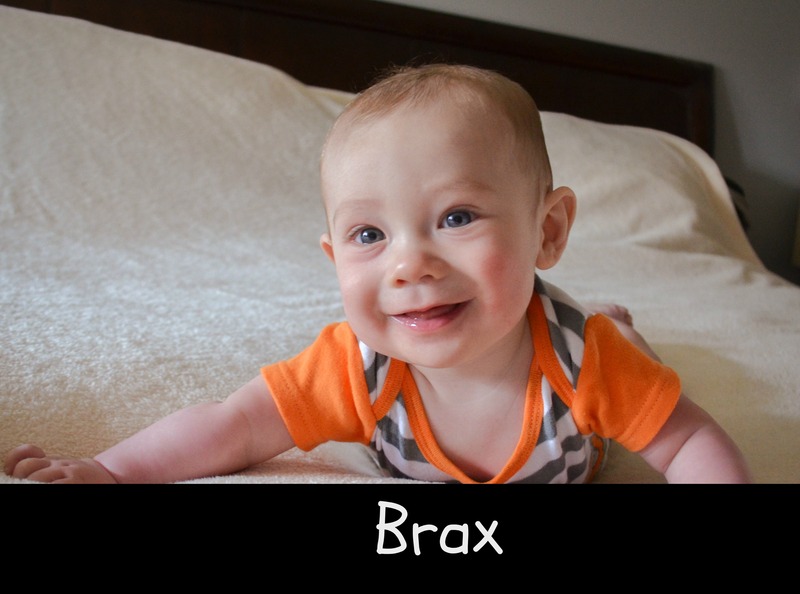 Reason #3: We genuinely love your kids! Let’s face it…nobody goes into this profession for the money. 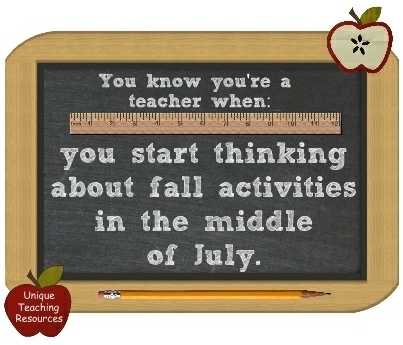 And you really can’t say that people go into teaching for the summers off anymore considering most school districts are on a balanced calendar and our summers are painfully shorter than they used to be. So why did we choose this profession? Because we genuinely love children! We want to make a difference in the lives of children! I can’t speak for every teacher, but I know that most of us spend a considerable amount of time trying to get to know and connect with each and every one of our students. I try to relate with them, whether it’s through books, sports, video games, or even fishing. I do this because I want them to know that they are accepted, worthy and loved. Most of you are aware that a large portion of our teacher evaluations is based on standardized test scores. We do everything we can to teach all the standards proficiently, and even if we teach until we’re blue in the face, little Johnny could come in on test day in a bad mood, click through his test indifferently and completely screw up my evaluation. To be honest, I could care less about my kids’ test scores. I spend every day with them and I can tell if they are where they need to be academically and what kind of growth they’ve made throughout the year. The bottom line is that at the end of the year, if I could make a difference in one kid’s life, then I feel that I have done my job. As teachers, yes we care about their academics, but we care MORE about developing their character and helping them succeed in life…not because we are paid to do so, but because we genuinely care about them. Need I say more? In August (or July for balanced calendar schools like mine), when you are buying school supplies for your child’s upcoming school year, or when you are taking pictures of your kids before they get on the bus before the first day of school, please keep these friendly reminders in mind. Teachers aren’t perfect and you may not agree with everything they do or say, but before you run to the school to cause a big scene, or before you type a nasty email or leave an angry message with them, please take a deep breath, count to 10 and think about the things I discussed. Unless the teacher has done something that puts your child in physical danger, or has done something illegal, just give them a little bit of grace and let it go. If you don’t get along with your child’s teacher or don’t agree with everything they do, a school year only lasts 180 days…just deal with it the best you can for that amount of time and grow from it. It is good for everyone to encounter people that you don’t necessarily see eye to eye on everything. It helps us grow. Be a good example for your kids and teach them how to handle those kinds of situations the right way. I am a parent myself, so I know the strong internal instincts we possess to protect our children, but remember they are in good hands. They are spending 180 days with someone who will love them, accept them, protect them, and do anything to help them succeed. I hope nobody sees this post in a negative way. This was not meant to bash or complain about parents. Like I said, most parents are wonderful to us. I just wanted to set the record straight that at the end of the day, we are on the same team. You love your kids, and we love your kids. We want them to succeed just as much as you do! Ryan is officially done with his second year of medical school…which also means that he is halfway to becoming a doctor and that he is DONE in Muncie!!! Those of you who have followed our journey know how hard this has been on us. 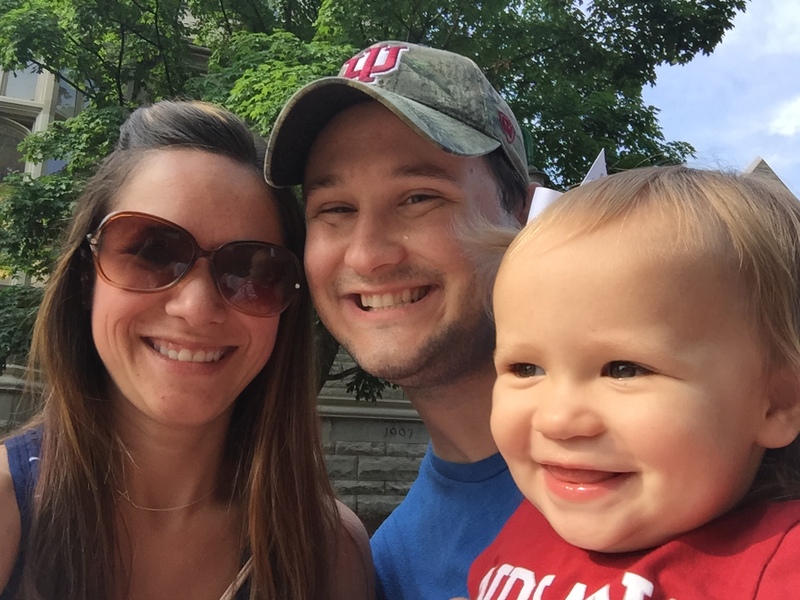 When I was 7 months pregnant, we found out that Ryan would be at the Muncie campus for his first two years at IU Med School. I know it could have been worse…he could have not gotten in to IU, or he could have been placed in Evansville or South Bend, or somewhere else hours away. However, it was still a rough and unexpected turn that I wasn’t ready for, especially since we were due to have our first child in just a couple months. 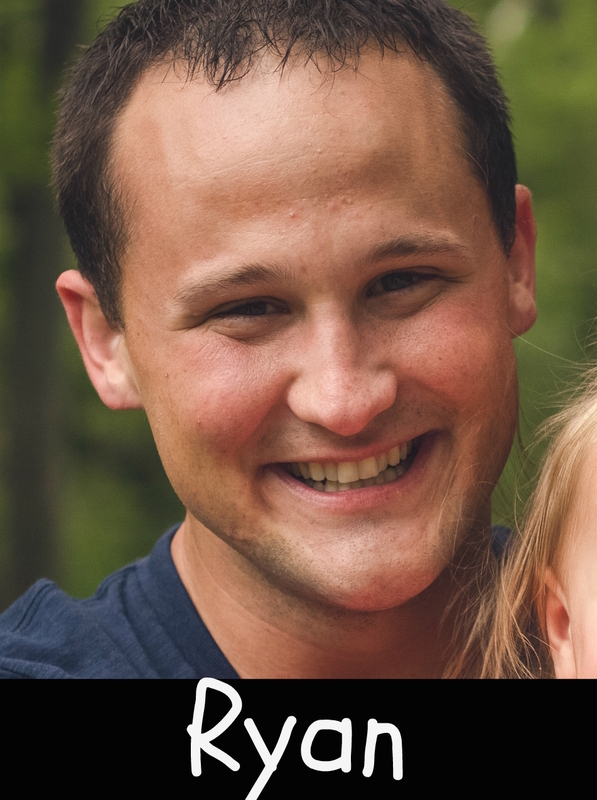 I would have moved to Muncie with him, but I didn’t think anyone would hire a teacher who would need a maternity leave right away. We ended up getting Ryan an apartment in Muncie where he would spend the majority of the week, then come home on the weekends. To say that the last two years was hard would be an understatement. It was exhausting working full time, raising a new baby, taking care of two dogs, and keeping up with all of the groceries and housework practically alone throughout the week (and we all know new moms don’t get the best sleep). I do have to give a quick shoutout to mine and Ryan’s parents for all of their support, whether it was feeding Kinsie and I dinner, helping me clean or run errands, or simply encouraging me when I was overwhelmed. I appreciate it more than I can say! It was hard too for Ryan being away from his family during the week and spending most of his time studying in a lonely apartment. As challenging as it was…I know that God’s hand was on us. It turned out the be a blessing in disguise for several reasons. While I would have much rather had Ryan at the Indianapolis campus, he would have been in a much larger class. 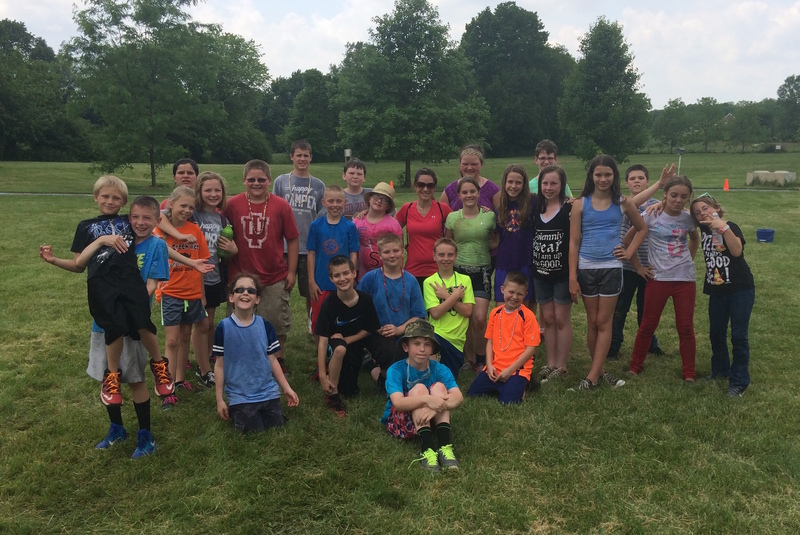 Instead, his Muncie class had 24 people, who have now become his best friends and an AWESOME support system for our family. I can’t thank them all enough for being there for all of us and welcoming me and Kinsie like we were family. Ryan being away also made us cherish our time together as a family. When he was away, that was his intense study time. When he was home, he would be fully engaged in us and did his best to be a loving, hands-on daddy and husband. I think being away from each other made us appreciate one another much more than if he were home each night. There have been many times in my life where things take an unexpected turn and I questioned God and wondered how I was going to handle it. But this situation proves that things are not always going to go according to our plan, but God has a better plan. We may not understand God’s plan, but it is ALWAYS better so we need to trust Him! Kinsie and I are SO happy to have Ryan back home. He’s been home since the beginning of May, but he had to spend practically every second of his time studying for his STEP 1 Boards. This test is a big one and will determine where he can get into residency, so he made sure he studied hard. Even though it was difficult, I supported him needing to study all the time because how he does on this test will affect our future. Kinsie wasn’t quite as understanding…she would often shut Ryan’s laptop, hand him a book and climb up on the couch for him to read it to her. He took his test on June 3 and we were all thrilled for him to be done. 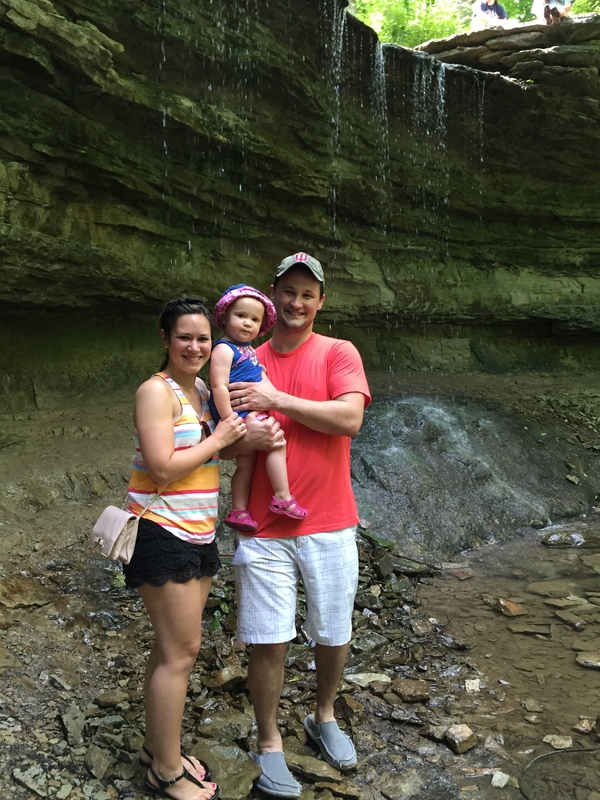 The next step in his med school journey is clinical rotations for two years. Most of these will be in Indy, which we are relieved about! After 2 more years, he will officially be an M.D. However, then comes residency. Depending on what he specializes in and what score he gets on the STEP 1 will determine where he will go for residency. We are hoping to stay in Indianapolis, but he will need to apply all over the country. Wherever he goes, Kinsie and I will be going with him! 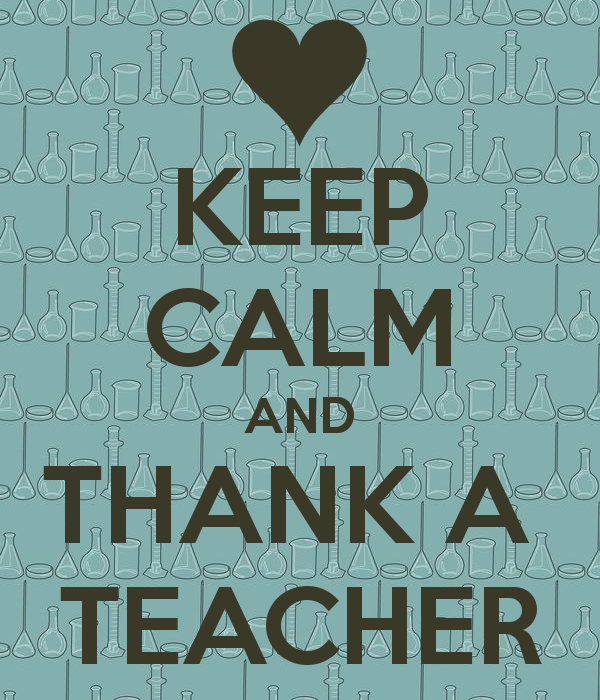 In other news, I have completed my 3rd year of teaching! It was a really rough start of the year with many administration and student behavior issues, but those issues were resolved and it turned out to be a great year for me. I got really close to my class, which made it hard to send them off to the middle school. But I’m sure you can imagine how excited I am to be on summer break and get to spend more time with my sweet girl! Ryan only had 4 days in between his test and the start of his clinical rotations, and we wanted to take a little trip, but obviously couldn’t go somewhere too far since we only had a few days. 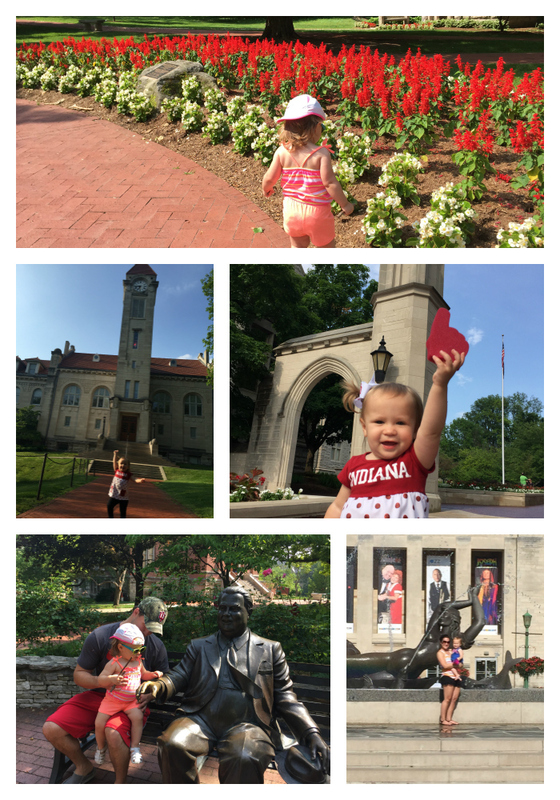 We decided to go to Bloomington…home of our Alma Mater, Indiana University. 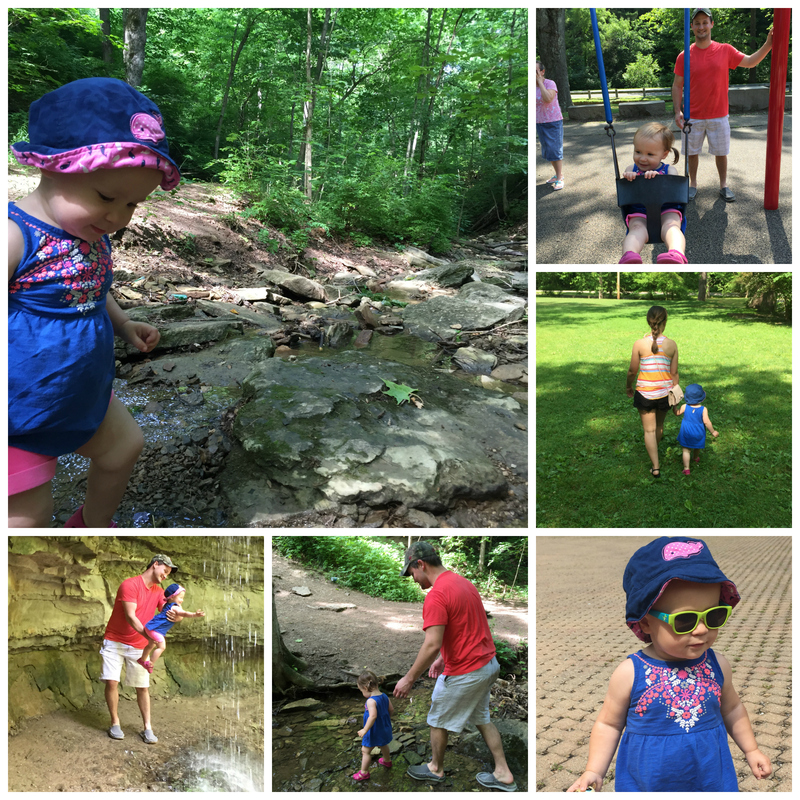 We LOVE this town and there are so many fun things to do and see. 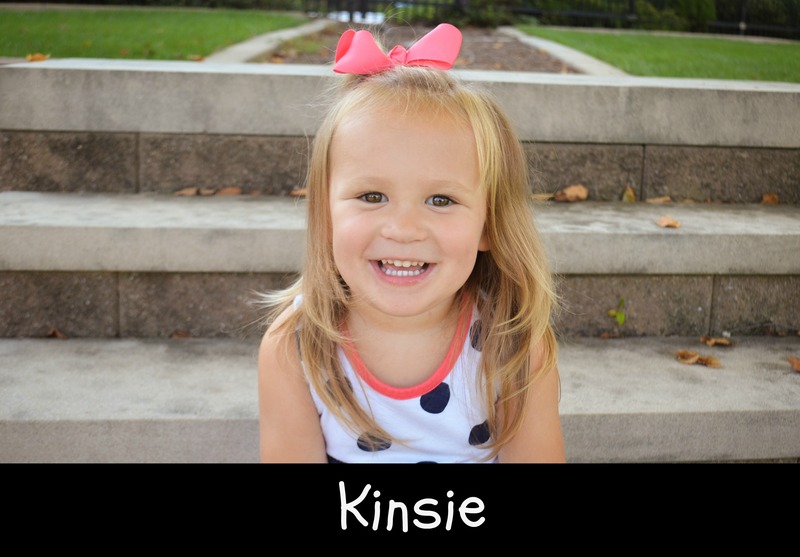 We loved getting to show Kinsie all of our favorite spots on campus. 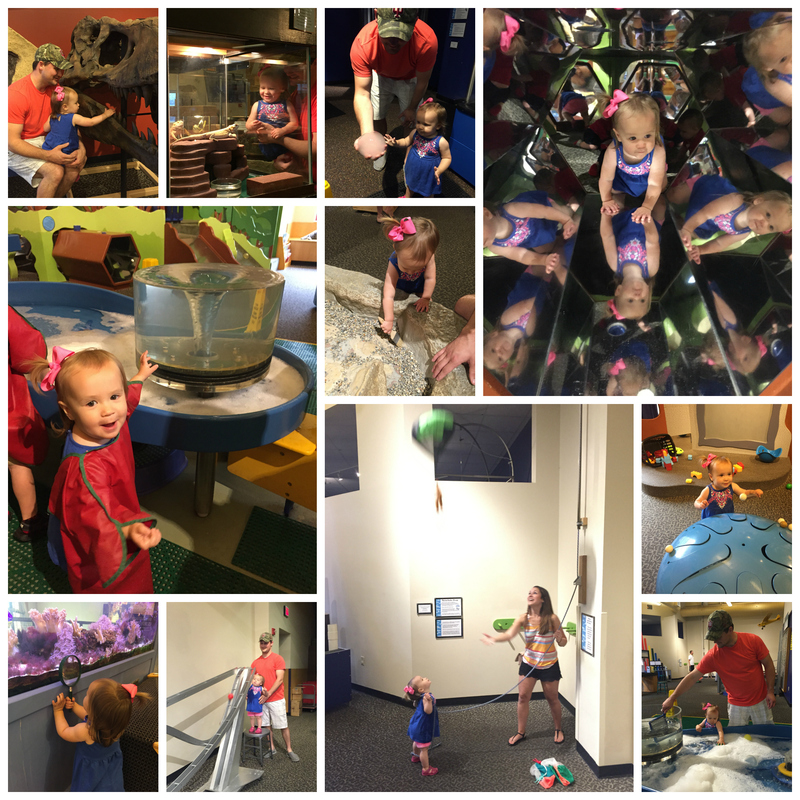 We went to Wonderlab Science Museum, went hiking at Cascades Park, walked around Kirkwood Avenue and showed her around campus. 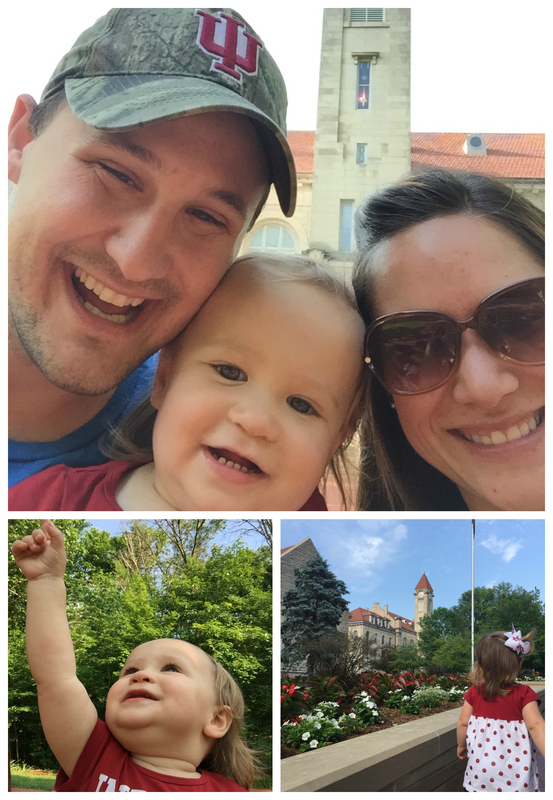 Her favorite part was the clock tower at the Student Building near the Sample Gates, which she called the “big girl clock.” She would belly laugh and squeal whenever the bell would ring on the clock! We had some awesome quality family time before Ryan had to start “work” full time. It was a much needed mini-vacation!